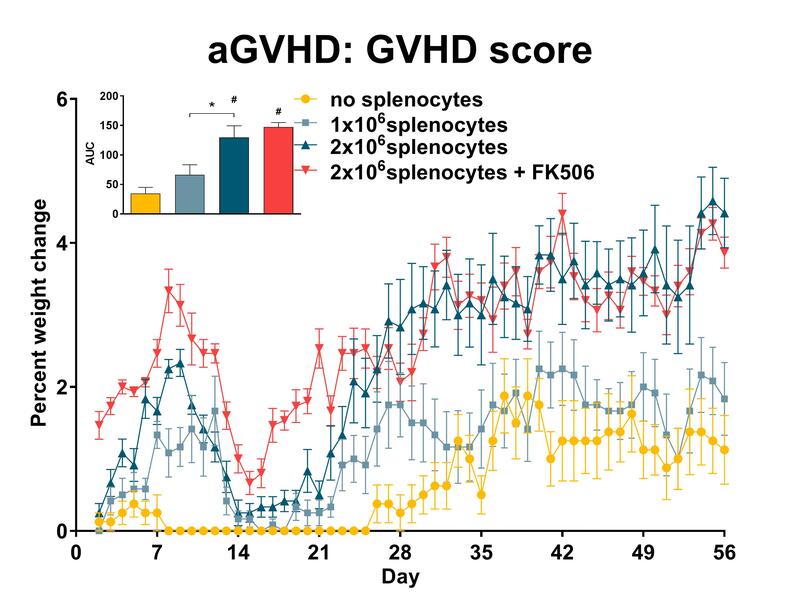 Graft-versus-host disease (GVHD) is defined as a syndrome in which cells originating from a donor recognize and mount a deleterious immune response against antigens found in the immunocompromised recipient. The disease presents as a heterogeneous condition involving multiple organs, most commonly the skin, mucosa, gastrointestinal tract, liver and lungs. 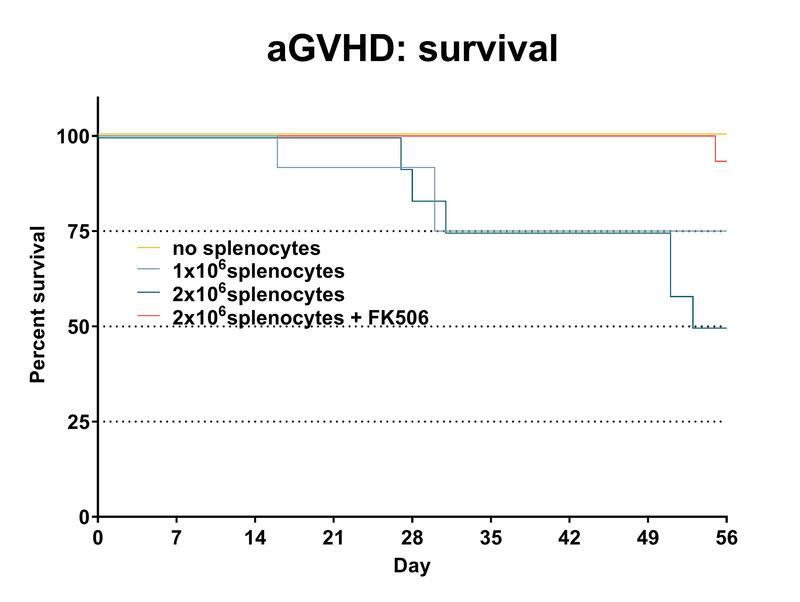 For patients undergoing allogeneic hematopoietic stem cell transplant (HSCT), GVHD is a significant cause of morbidity and mortality; up to 80% of patients will develop GVHD at approximately 14 -21 days following HSCT (acute), and of those surviving beyond 100 days, between 30 and 70% will develop chronic GVHD. 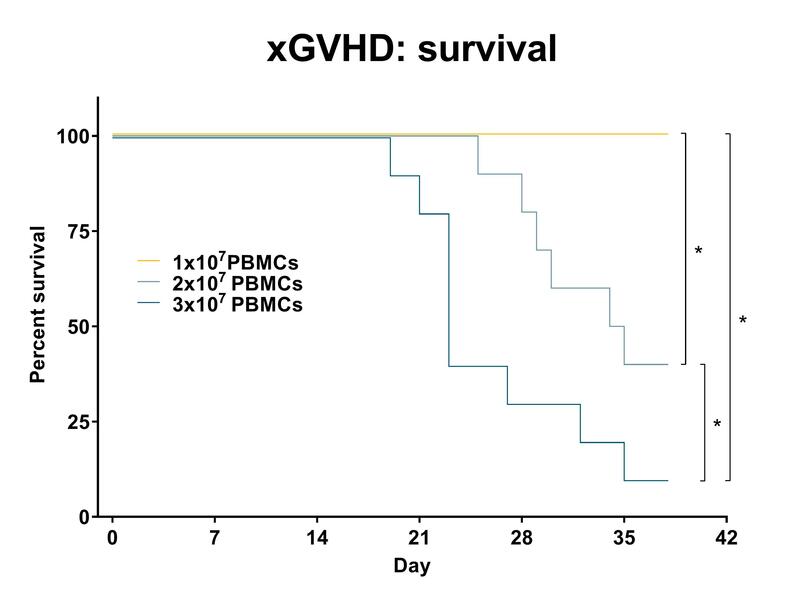 Unsurprisingly, chronic GVHD represents the single leading cause of death in HSCT survivors. 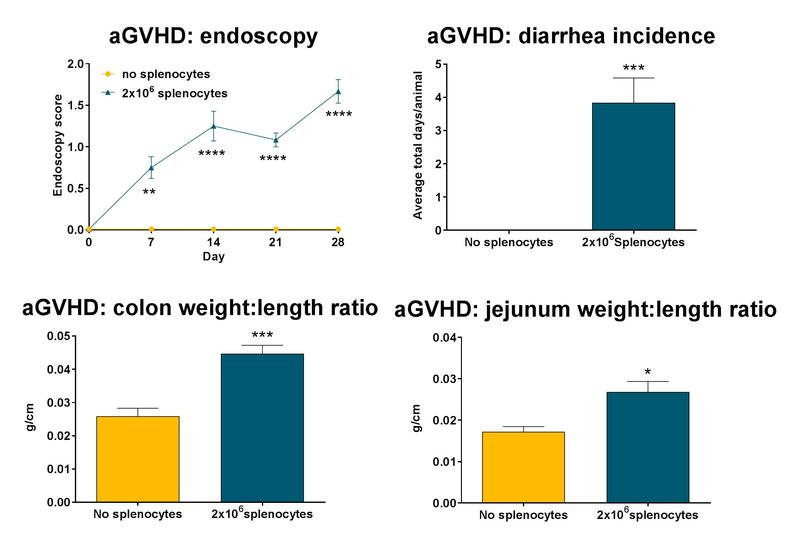 Development of GVHD is dependent on the activation of antigen-specific donor T cells that are able to mount a specific immune response targeting host tissues. This event is potentiated by conditioning of the host prior to HSCT in order to suppress the immune system and ensure effective engraftment. The focus of current therapy is general immune suppression using corticosteroids, which has dubious efficacy; sustained amelioration of disease symptoms are only seen in around 50% of patients. More promising therapies are based on the prophylactic prevention of GVHD, and use T cell targeting agents such as methotrexate, tacrolimus, and JAK/STAT inhibitors. Recipient mice are pre-conditioned with a lethal dose of total body irradiation prior to the adoptive transfer of T-cell depleted bone marrow supplemented with splenocytes harvested from an MHC-mismatched donor mouse. 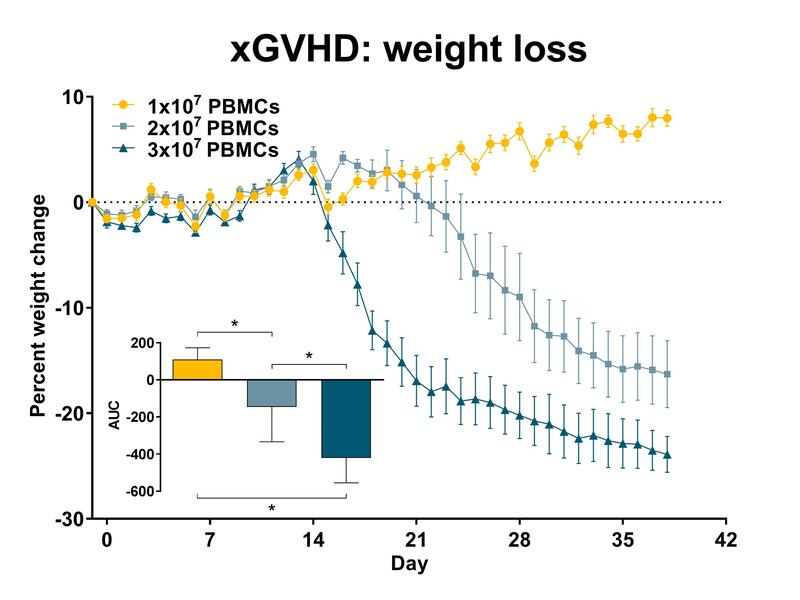 Following transplant, the mice rapidly lose weight due to the conditioning regimen and then partially recover by day 14, after which they develop a progressively worsening disease characterized by weight loss and increasing GVHD score. 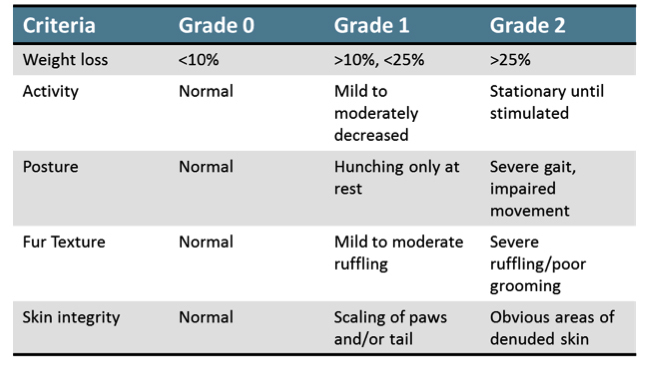 Endpoint survival in untreated mice is approximately 50%. 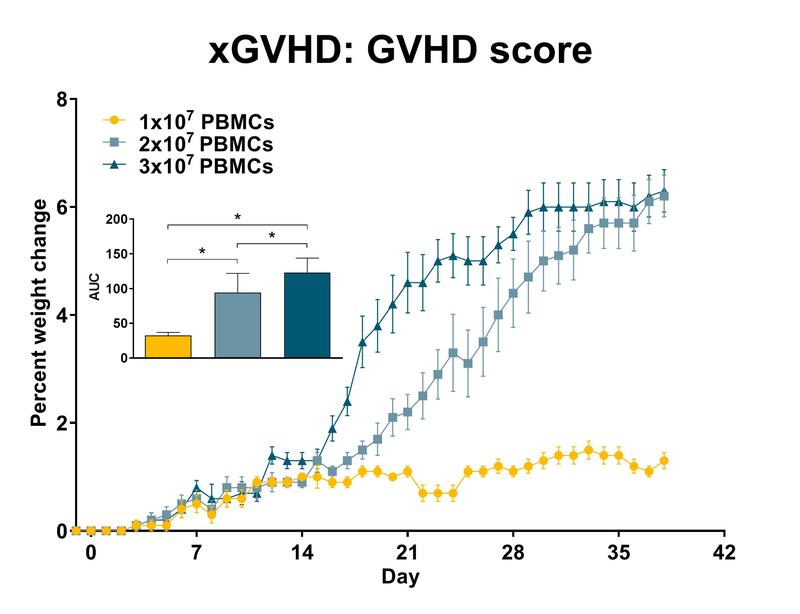 Recipient severely immunocompromised (NSG) mice are injected with a pre-determined number of purified single-donor human PBMCs. 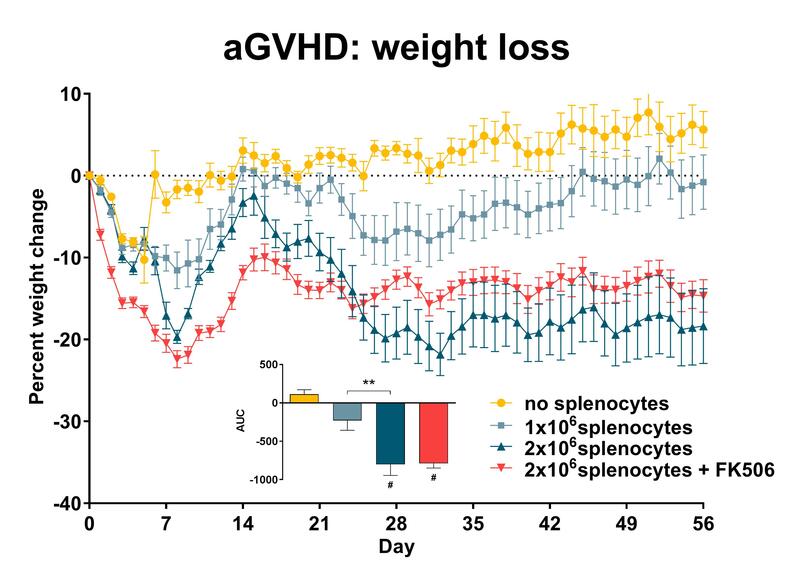 Following transplant, the mice develop a progressively worsening disease characterized by weight loss and increasing GVHD score. 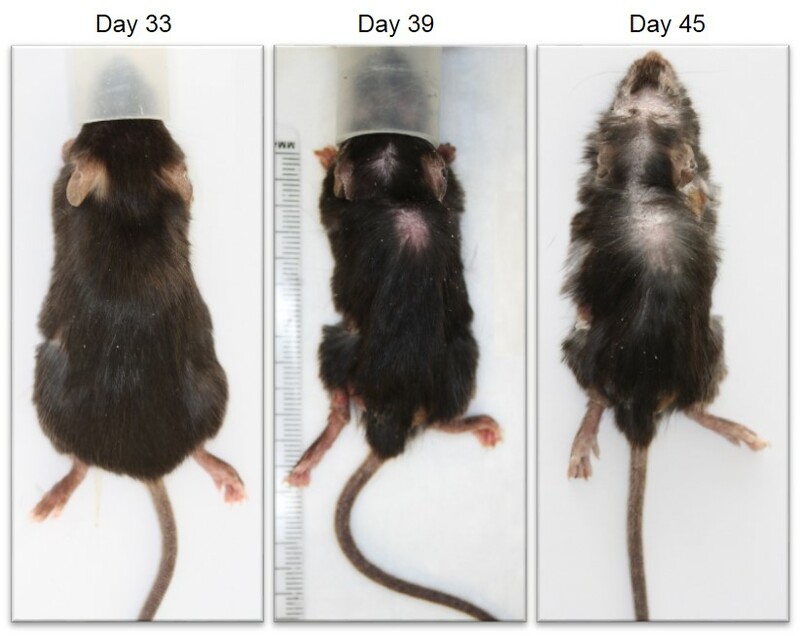 Endpoint survival in untreated mice is determined by the number of cells injected. Cryopreserved PBMCs from identified donors are available for maximizing continuity across multiple studies.